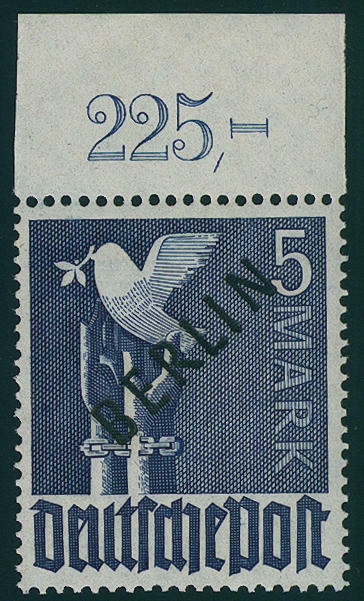 6428 17/20 1-5 Mk. 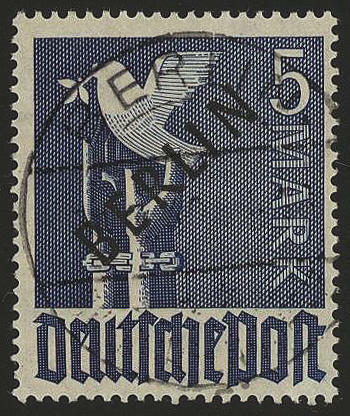 Black overprint, fresh colors and in perfect condition mint never hinged, expertized Schlegel BPP. Michel 255,- €. 6429 ⊙ 17/20 1-5 Mk. 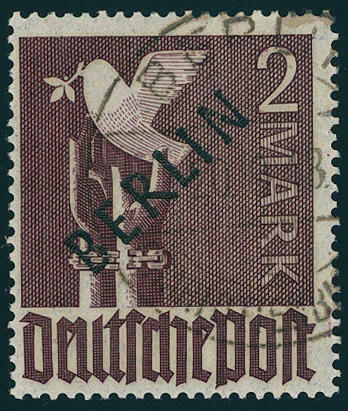 Black overprint, fresh colors and neat cancelled \"BERLIN\", the three key values perfect centric, photo expertize Hans-Dieter Schlegel BPP. 6430 17/20POR 1-5 Mk. 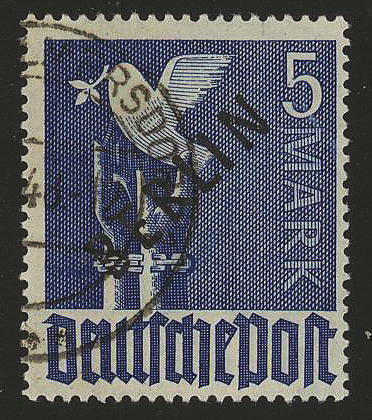 Black overprint, all fours values uniform from upper margin in the plate printing with not throughout perforeted margins, unfolded, in perfect condition mint never hinged, expertized Lippschütz. Michel 1370,- €. 6431 ⊙ 17aIVa 1 Mk. Black overprint with scarce overprint error \"R broken\", fresh colors and neat cancelled \"Berlin Wilmersdorf 7.10.48. \". Photo expertize Hans-Dieter Schlegel BPP. Michel 1500,- €. 6432 ⊙ 18 2 Mk. 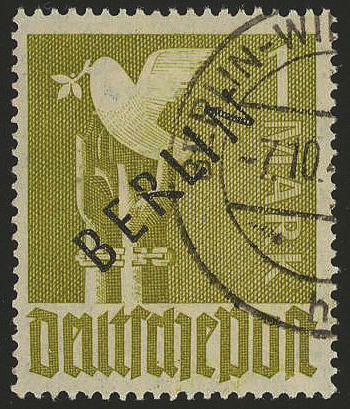 Black overprint, fresh colors and very well perforated, neat cancelled \"BERLIN\", expertized Schlegel BPP. 6433 ⊙ 18 2 Mk. 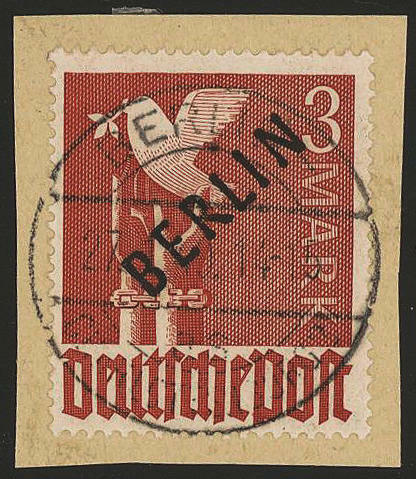 Black overprint neat cancelled \"BERLIN-CHARLOTTENBURG\", fresh colors and very well perforated, photo expertize \"the quality is perfect\" Andrew Schlegel BPP. 6434 ⊙ 18 2 Mk. 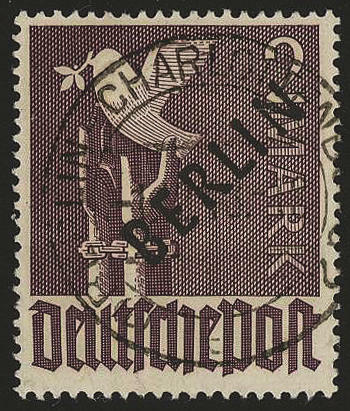 Black overprint, fresh colors and neat cancelled \"BERLIN-CHARLOTTENBURG\", expertized Schlegel BPP. 6435 ⊙ 18 2 Mk. Black overprint, fresh colors and very well perforated, in perfect condition centric cancellation \"BERLIN-CHARLOTTENBURG 1.12.48. \". Photo expertize \"the quality is perfect\" Hans-Dieter Schlegel BPP. 6436 ∆ 18 2 Mk. 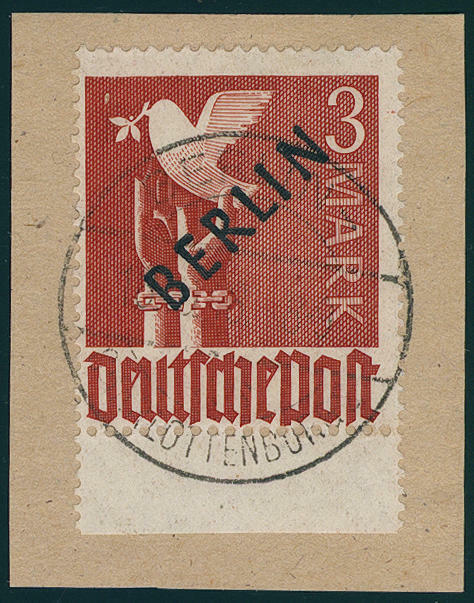 Black overprint, fresh colors and very well perforated on beautiful letter piece, perfect centric and neat cancelled \"BERLIN-CHARLOTTENBURG 27.1.49. \". For the highest standards! Photo expertize \"the quality is perfect\" Hans-Dieter Schlegel BPP. 6437 ⊙ 19 3 Mk. 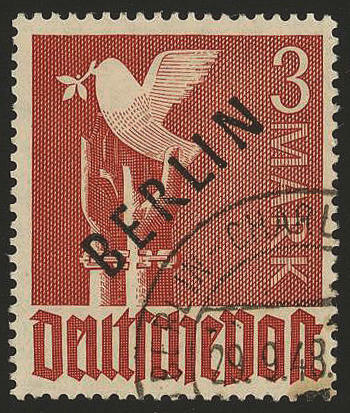 Black overprint, fresh colors and very well perforated, in perfect condition and centric neat cancelled \"BERLIN-CHARLOTTENBURG 1.10.48. \". Photo expertize \"the quality is perfect\" Hans-Dieter Schlegel BPP. 6438 ⊙ 19 3 Mk. 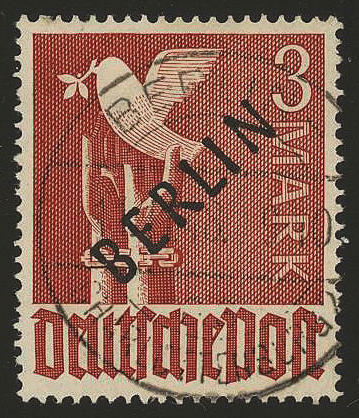 Black overprint, fresh colors and neat cancelled \"BERLIN-CHARLOTTENBURG 29.9.48. 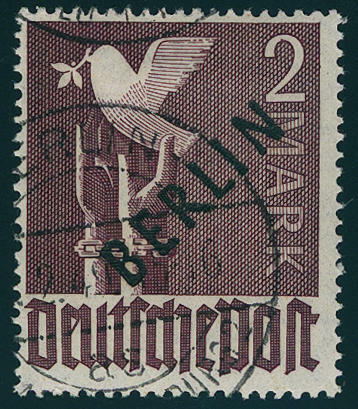 \", expertized Lippschütz BPP, Schlegel BPP. 6439 ⊙ 19 3 Mk. 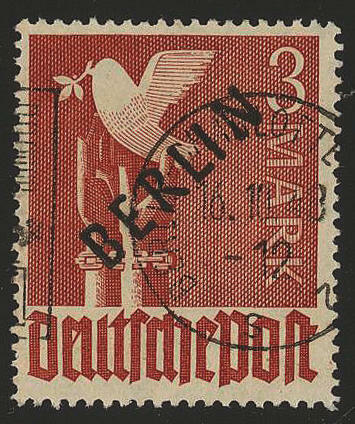 Black overprint, fresh colors and neat cancelled \"BERLIN\", expertized Schlegel BPP. Michel 700,- €. 6440 ⊙ 19 3 Mk. 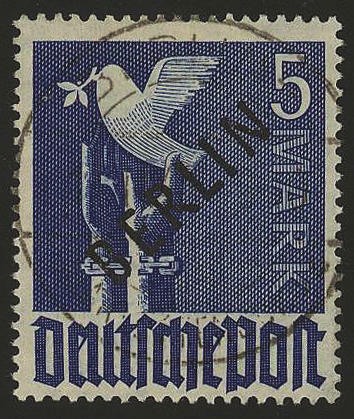 Black overprint, fresh colors and very well perforated, neat cancelled \"BERLIN-CHARLOTTENBURG 16.10.48. \". Photo expertize \"the quality is perfect\" Hans-Dieter Schlegel BPP. 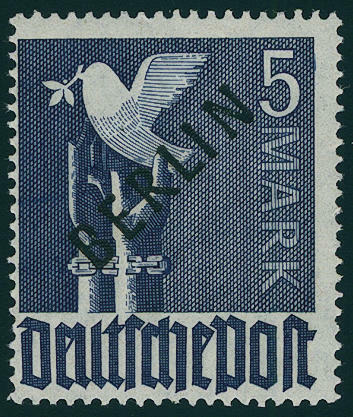 6441 ∆ 19 3 Mk. 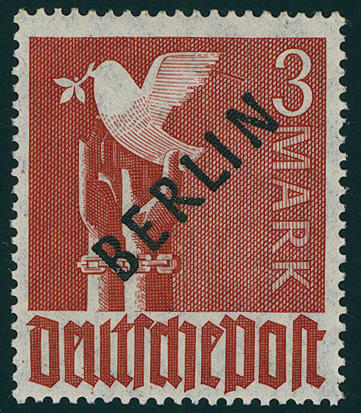 Black overprint, fresh colors and very well perforated on magnificent letter piece with centered neat postmark \"BERLIN-CHARLOTTENBURG 18.10.48. \". Outstanding quality! Expertized Schlegel BPP. 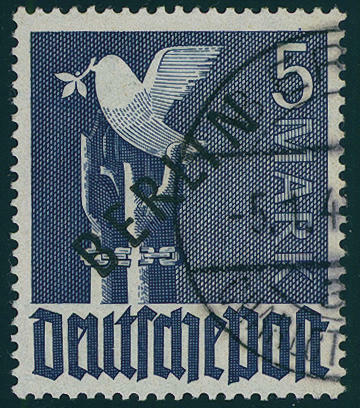 6442 ∆ 19 3 Mk. 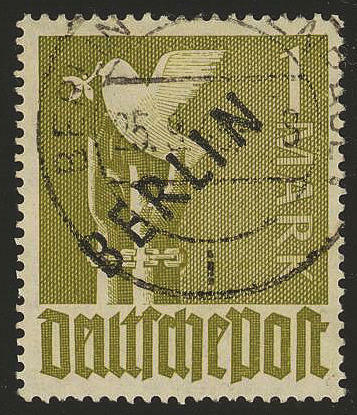 Black overprint, fresh colors and very well perforated on beautiful letter piece, perfect centric and neat cancelled \"BERLIN-CHARLOTTENBURG 27.1.49. \". For the highest standards! Photo expertize \"the quality is perfect\" Hans-Dieter Schlegel BPP. 6443 19VIII 3 Mk. 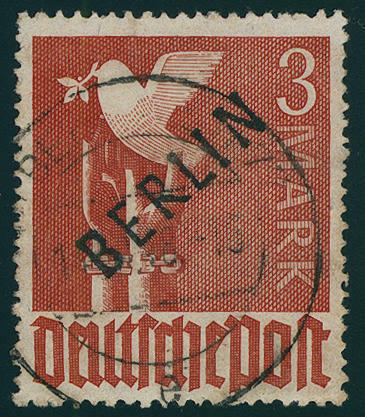 Black overprint with scarce plate flaw \"branch at the pigeon wing\", fresh colors and very well perforated, in perfect condition mint never hinged photo expertize \"the condition is perfect\" Hans-Dieter Schlegel BPP. Michel 2000,- €. 6444 ⊙ 20X 5 Mk. 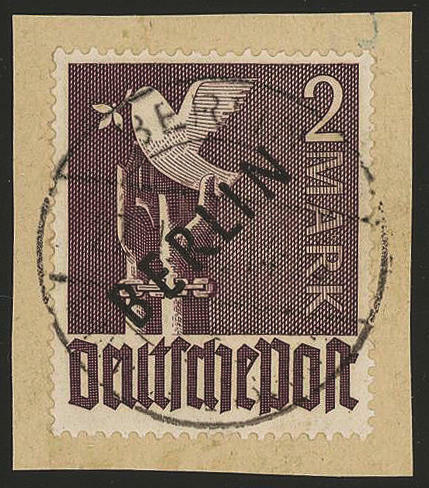 Black overprint with scarce overprint error \"two breaches in the lower margin of sheet of the B\", fresh colors and very well perforated, neat cancelled \"Berlin Wilmersdorf\". There are only few examples from this known! Photo expertize \"the quality is perfect\" Hans-Dieter Schlegel BPP. Michel 1500,- €. 6445 ⊙ 20 5 Mk. 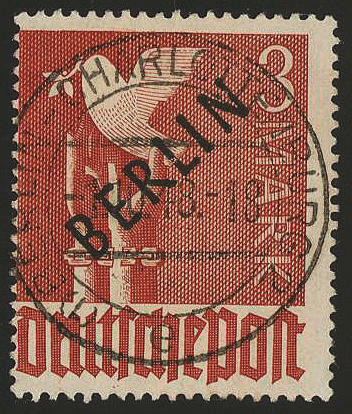 Black overprint, fresh colors and neat cancelled \"BERLIN-CHARLOTTENBURG\", expertized Schlegel BPP. Michel 750,- €. 6446 ⊙ 20 5 Mk. 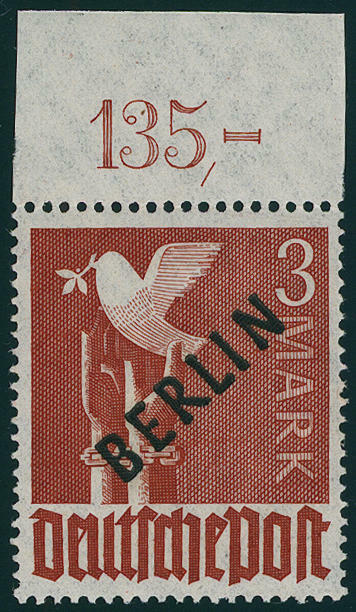 Fresh colors and very well perforated, very fine centric cancellation \"BERLIN-CHARLOTTENBURG 31.3.49\", photo expertize \"the quality is perfect\" Hans-Dieter Schlegel BPP. 6447 ⊙ 20 5 Mk. 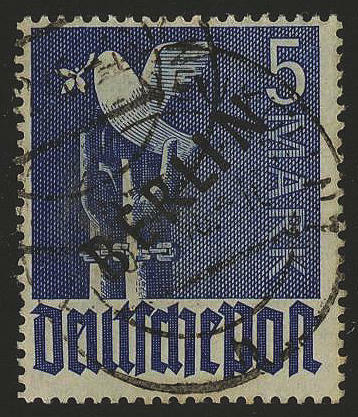 Black overprint, fresh colors and neat cancelled, expertized Schlegel BPP. Michel 700,- €.